During a roundtable interview for Wes Anderson‘s Isle of Dogs at the ongoing 68th Berlin International Film Festival, our own Steve Weintraub had a chance to ask the stop-motion movie’s star Liev Schreiber a couple of questions about another highly anticipated animated project he’s appearing in: Sony Pictures Animation’s Spider-Man: Into the Spider-Verse. COLLIDER: What was it about that project that made you say, “I want to do this,”? SCHREIBER: It was actually the animation team. The guys who are working on it, I saw their work and said, “Wow! These guys are special.” And it is. It’s going to be pretty special, from what I’ve seen so far. And I haven’t seen much, but it’s pretty special. They’re super-talented. And just working with them in the brief time that we did on my stuff, I’ve been in a bunch of these different situations, and these guys have their ducks in a row. And they’re collaborative. They know what they want and they’re clear, they’ve got all their sequences and their animatics, but you come up at them with a creative idea and they shift, they do it nimbly and with great execution. COLLIDER: It looks like it’s inside a comic book, the animation. SCHREIBER: Yeah! That’s what I love about it. But it also is anamorphic … Oh, I don’t know if I should have said that. [laughs] If you know something about film, that’s an amazing thing for an animated film to do that well. Anamorphic is the stretched-out format and it really is a much broader, bigger canvas, which is unusual for animation because you’re generally trying to focus the action. These guys have decided to go anamorphic with it and it’s stunning. If you’ve seen that trailer, you already get a sense of what it is. Now fans are finally learning more about Spider-Man: Into The Spider-Verse thanks to Sony's presentation at CinemaCon, where ComicBook.com was on hand to capture all of the new details. The presentation featured loads of new footage that wasn't shown in the movie's initial teaser trailer. The footage was mostly unfinished, with a lot of work ahead of the animators before the film's premiere at the end of the year. The movie will feature classic villains like the Green Goblin, Kingpin, and the Prowler. The last one makes sense considering Miles Morales' mythos, in which his uncle Aaron Davis is a criminal thief who attempts to blackmail his nephew into committing crimes. The Green Goblin in the footage looks like a dragon, probably inspired by the Ultimate version of the character. This one has wings protruding from his back. In this film, the Peter Parker Spider-Man is found dead at the age of 26. Miles Morales, inspired by his hero and gifted similar powers, pays homage to the original Spidey with a makeshift costume. Things take an interesting turn when Miles is approached at Peter's grave — by an older, disheveled Peter Parker (who suspiciously sounds like Jake Johnson, but we can't confirm at this point). This is our first glimpse at the wider Spider-Verse, we're guessing, given the alternate version of the one true Spider-Man. This chubbier Peter offers to mentor Miles, and footage shows two Spider-Men swinging through the city. The footage also revealed that Miles' father is a cop in this continuity. While we're starting to learn more about the movie, producers Phil Lord and Christopher Miller promised it would focus on the Ultimate Spider-Man. "We wanted to make a story about Miles. And when they came to us, it seemed like an amazing opportunity to tell a different kind of Spider-Man story," Lord said at CCXP last year. "The thing that's exciting to us is the idea that anyone can be behind the mask. It seemed like a really great opportunity to subvert your expectations of what you thought a Spider-Man movie could be." That's the premise for Spider-Man: Into the Spider-Verse, the first-ever big screen animated movie starring Spider-Man — more accurately, Spider-Men. Sony Pictures showed off the upcoming Sony Pictures Animation production at CinemaCon in Las Vegas, presenting a mix of exclusive but incomplete footage from the CG-animated Spidey tale and big screen debut of Afro-Latino teen Miles Morales. Tom Rothman, Chairman, Sony Pictures Entertainment Motion Picture Group, dubbed the “8-to-80 PG event film” Sony's “bright and shining Christmas present” for 2018, following the all-ages Dwayne Johnson-led blockbuster hit Jumanji: Welcome to the Jungle, arriving just before Santa last year. “It's his Brooklyn upbringing, it's his culture. He's half-Puerto Rican, half-African-American, he's a product of a happy and alive family, he's 13-years-old,” Miller said. Miles Morales has never had a comic book that succeeded, but I think that's inconsequential to this. I think it looks really good. I think I might go see it in a theater. And I don't care what anyone thinks, I'm stoked for Spider-Gwen or whatever they'll call her! De-uniquing the characters is so DC. I like a few of the DC replacements better. Hal Jordan is far better than Alan Scott -- and Guy Gardner was the only reason to read Justice League in the late '80s. Likewise, Barry Allen beats Jay Garrick in my book. Johnny Storm as the Human Torch is better than the android. Or at least more versatile as a character. 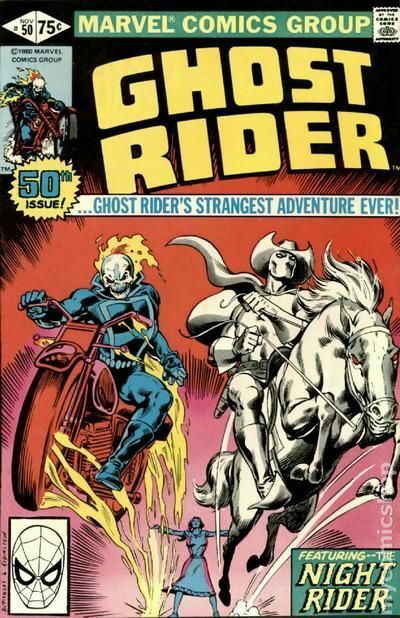 Johnny Blaze as Ghost Rider was much cooler (to this kid in the 70's) than Carter Slade. It's funny -- one of my favorite parts of the otherwise-horrible Ghost Rider movie was when Sam Elliot revealed himself to be the Golden Age Ghost Rider, and they rode off together (to "Riders on the Storm," no less) in a direct homage to Ghost Rider # 50. # 1 Trending Video on YouTube right now. Did you really just "Funny post" your own post? Hahahaha. More specifically when he asked do animals talk and the guy faints LOL!!! That literally made me snort a laughter . I'm not usually someone who pays to see an animated film in the theater (except for Transformers: The Movie) but this looks like it would be worth it... .
Looks like to be a hit with modern audiences. I know my children are already asking me to make sure we go to it around Christmas.